China’s Belt and Road Initiative, sometimes referred to as the 21st-century Marshall Plan, is far grander in its scope and ambition than the post-World War II US aid initiative. The goal of the BRI is to link China to the rest of the world by two great arcs of international trade – a land-based ‘belt’ and a maritime ‘road’ stretching west to Europe and Africa and south to Southeast Asia and Australia. 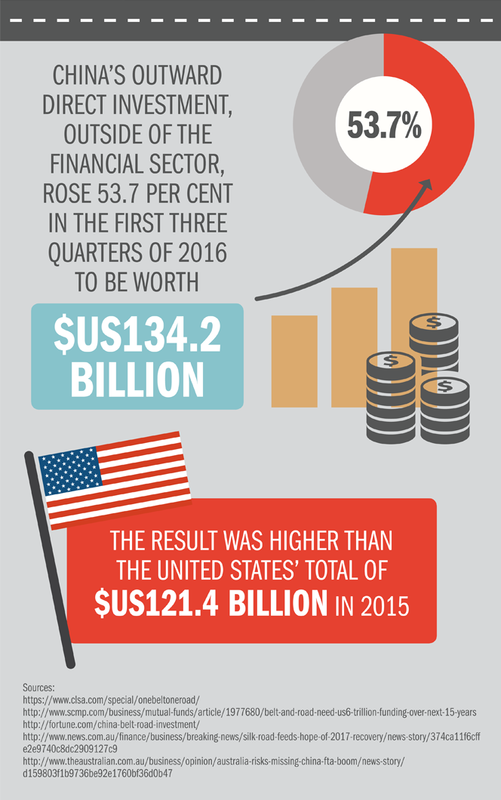 Estimates of the total investment involved range between $US1.4 trillion and $US6 trillion, depending on which projects are included and the timescale used. 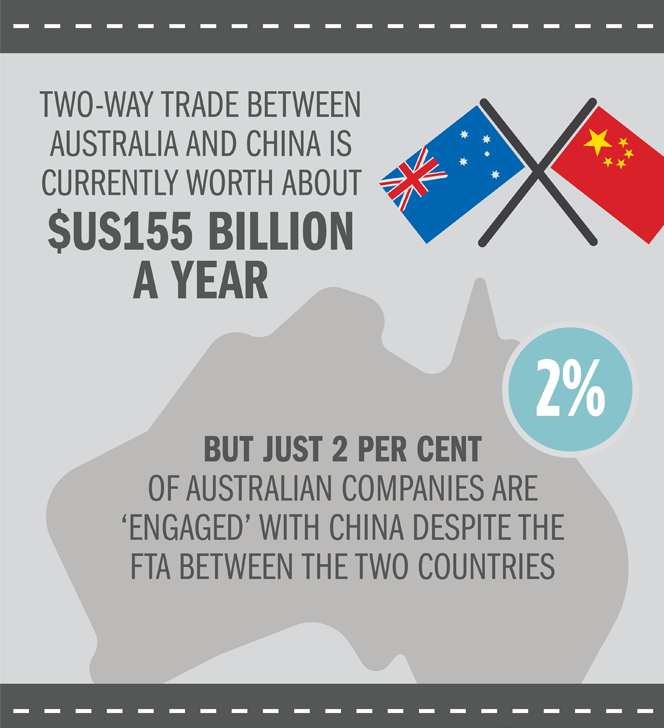 At a time of increasingly isolationist political thinking in the West, China’s massive commitment to broadening and deepening its international ties represents a huge opportunity for Australia and other countries in the region. The development of ports, logistics hubs and other infrastructure across 60 countries is central to the BRI, and work on joint projects with China is already underway in many partner nations. Last year, Chinese shipping company Cosco took a majority stake in the Greek port of Piraeus, from where Chinese firms are constructing a high-speed rail network to Hungary and eventually Germany. 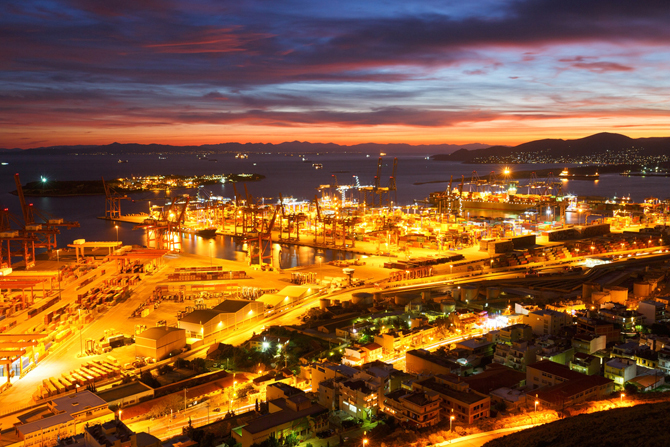 The Greek port of Piraeus. PHOTO: Shutterstock. In Pakistan, a $US46-billion mega-scheme is underway to build a network of roads, railways, energy projects, trading parks and related infrastructure to link up to western China. A Bangladesh-China-India-Myanmar economic corridor will connect South Asia with Southeast Asia. Other projects commenced or in planning include a high-speed train line between the Indonesian cities of Jakarta and Bandung, gas pipelines in Turkmenistan and a rail link to Afghanistan’s Hairatan port. China is even developing its own answer to GPS, the Beidou Navigation Satellite System, which by 2018 will include 18 satellites covering nations involved in the BRI. 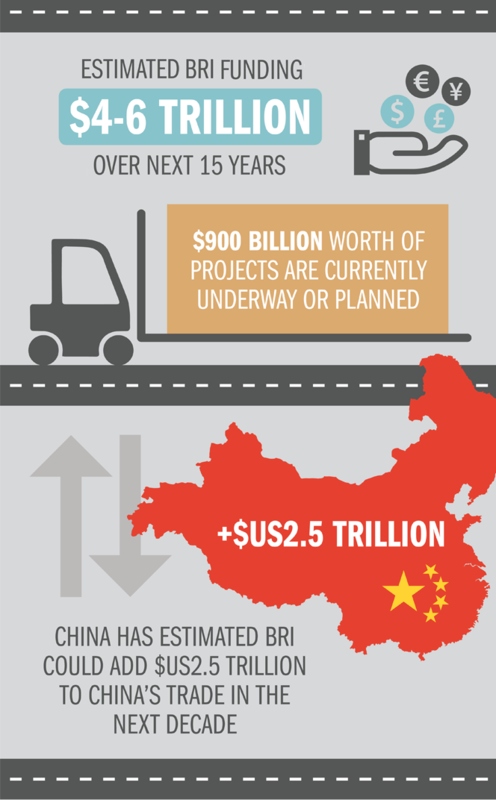 Beijing-backed financial institutions such as the New Development Bank, Asian Infrastructure Investment Bank and The Silk Road Fund have a combined financial firepower of $US240 billion ready to commit to BRI projects, but long-term capital requirements will be far higher. The vast initiative will run over several generations and its sheer scale and ambition will impact across global initiatives, such as shifting to a lower carbon economy. He has no doubt about the potential importance however. Khoon Goh, Head of Asia Research at ANZ, says China hopes to achieve several goals with the BRI. “China has an excess capacity issue,” he says. “Global trade isn’t strong enough to absorb all the products China is producing. 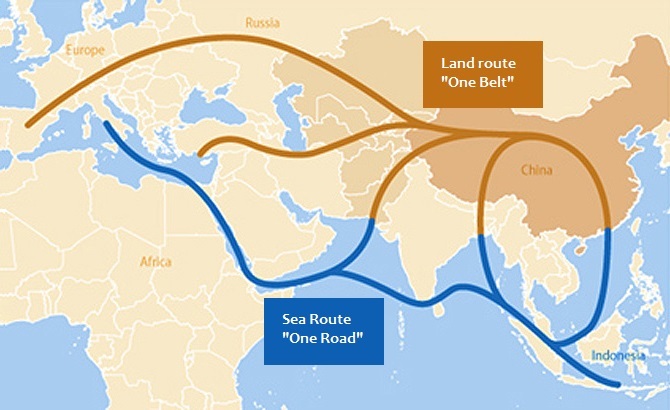 Belt and Road is a way for China to create new routes to get its products into its major markets. “At the same time, it allows for greater infrastructure investment as well, connecting up the interior regions of China and expanding economic activity inland – up until now, most growth has tended to be towards the eastern seaboard. “But it’s not just limited to China. It extends to anywhere that can allow more connectivity into China or out. Lizzie Knight, a partner at Australian law firm Corrs Chambers Westgarth, says the BRI is also intended to help uplift under-developed regions where economic stagnation has helped fuel political unrest and fundamentalism. “For China, the (ethnic minority) Uighur have long been a concern,’’ she says. “How do they bring them into China and make them feel a part of the nation? 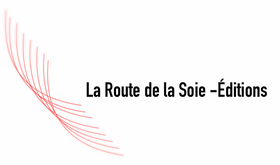 Part of that is providing services that are equal to what you might find in Beijing or Shanghai. Knight says she was impressed by the sheer scale of China’s commitment to the BRI. In 2016, Knight travelled the breadth of China from Beijing to Kashgar along the route of the Belt, much of which follows the historic Silk Road that linked East and West thousands of years ago. “There are huge, obvious opportunities for Australian businesses,’’ she says. “Take Urumqi, for example - a city with population of 3 million, roughly the same size as Melbourne. Some of the things they are looking at there are education facilities, hospitals, logistics and warehousing. “Or Kashgar, where they are about to build four additional airports as part of their logistics hub. As China flexes its military muscle in the South China Sea, the expansionist aspects of the BRI have fuelled suspicion in some quarters. But Nick Henderson, director of Business China Practice at think-tank Asialink, says the BRI should not be seen in that light. “This is a vision to open up trading routes,’’ Henderson says. Henderson says through the BRI China is attempting to use economic expansion and investment to address challenges such as social instability, food security and access to natural resources. This should not be seen as a threat to her neighbours. China needs the infrastructure and regional partnerships of the BRI to facilitate free flow of trade so as to support long-term growth, he says. “Stronger regional trade routes and economies will have a self-reinforcing positive effect on Chinese economy and the region for decades to come,’’ says Henderson.